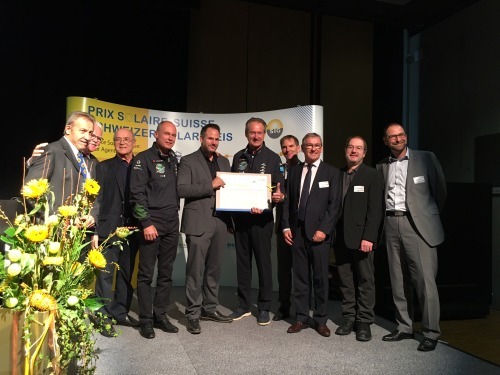 Our pilots – Bertrand Piccard and André Borschberg – were rewarded the World Solar Prize by the Swiss Solar Agency for successfully making their crazy dream of flying around the world with no fuel powered only by the energy of the sun a reality, thereby attracting “unmatched international attention” to renewable forms of energy. “Solar Impulse 2 sparked unique, unmatched international attention for renewable energies, solar energy and clean technologies,” said the Swiss Solar Agency in a statement. Already in 2010, our pilots had won the agency’s Swiss and European prizes. The prize was one of 14 Swiss Solar Awards being presented yesterday at the olma agricultural fair in St Gallen. Every year, the Swiss Solar Agency recognizes a selection of exemplary buildings, institutions and people for their contributions to solar energy. However, it grants the so-called World Solar Prize only occasionally, the previous “world” prize went to British architect Norman Foster in 2005. Born in Switzerland, Solar Impulse’s aim was not only to design and build a solar airplane, but to develop a symbol which would attractively promote a pioneering and innovative spirit in the field of renewable energy and clean technologies. This award is therefore a very nice acknowledgment for Bertrand, André and the team!